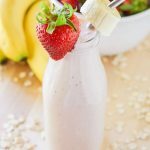 Looking for a healthy breakfast smoothie recipe? 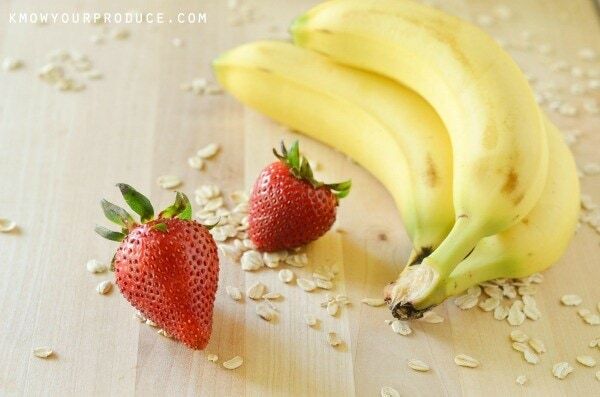 Try our vegan Strawberry Banana Oatmeal Breakfast Smoothie! Breakfast smoothies are fun and easy to make. You can easily add a lot of calories and sugar to a smoothie without realizing just how much you’re eating. When you make smoothies you’re processing the food inside of the blender instead of your mouth. Two things, chew your smoothe and take it slow. 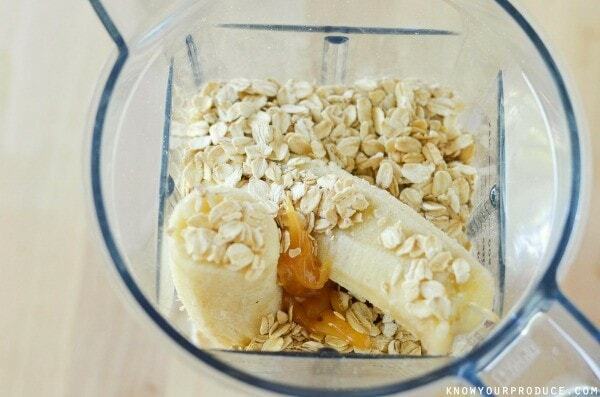 A smoothie won’t fill you up as much as the unprocessed food will which is why we like to add in some oatmeal. We love to start our day with a huge smoothie and now that our daughter can eat oats we’re having a ton of fun. Oatmeal is delicious with tons of fresh fruit, but our daughter is so new to oats that we’re keeping oats simple. 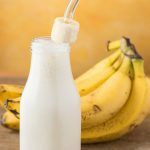 Everyone just loves drinking smoothies in glass jars and these milk bottles are our favorite by far. 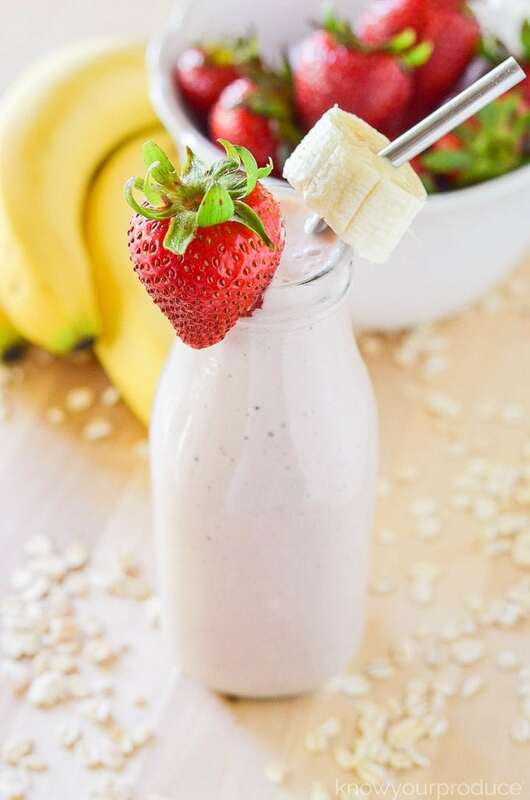 Our Strawberry Banana Oatmeal Breakfast Smoothie was guaranteed to be a winner for her. She devoured her entire smoothie in less than 5 minutes and then asked for MORE! 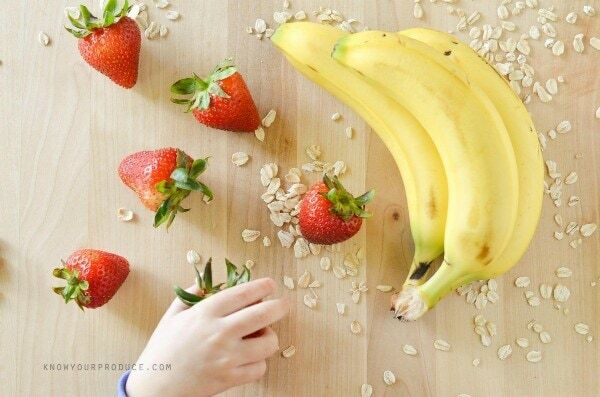 We love to use beautiful, fresh sweet strawberries in this Strawberry Banana Oatmeal Breakfast Smoothie. For the banana, we like to use frozen. We buy tons of bananas at the store and let them get a bit brown. Once the bananas are brown we peel them and freeze the bananas for smoothies, blend into juices or even make banana ice cream! We like to use natural sweeteners like honey, agave or maple syrup. Since we were making a smoothie we stuck with fresh local raw honey. You can use less or more sweetener depending on how sweet your strawberries are (learn how to pick strawberries). It’s a little thick but blends right into our smoothie in our Vitamix. We also own a Blendtec that works really well too! The main reason we suggest using a higher speed blender is to really grind down the oats. You can pour into any fancy glass or even into a mason jar and drink it through a stainless steel straw. You can buy stainless steel straws online in different varieties. 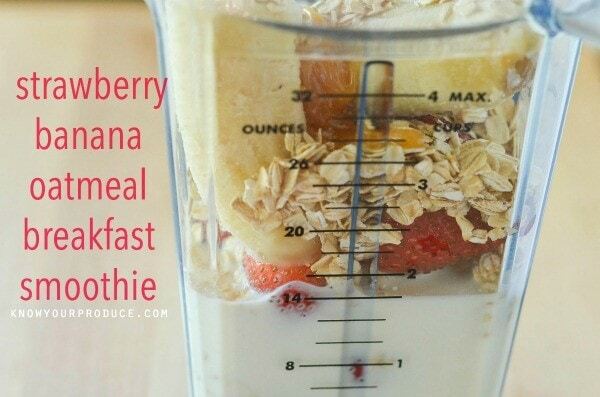 Place all the ingredients in a high-speed blender and blend, it’s that easy! 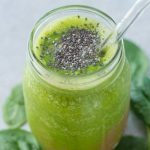 This smoothie makes enough for two people or one large serving for yourself if you’re not eating anything else for breakfast. 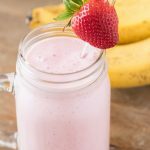 We like to pair our Strawberry Banana Oatmeal Breakfast Smoothie with scrambled eggs or avocado toast. We really hope you enjoy this recipe and can’t wait to hear how you like it! 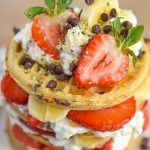 If you enjoyed this recipe, try out these recipes too! 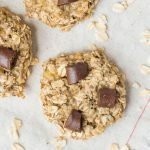 1 Cup Oat Milk can use almond, coconut, or soy. Note: the more strawberries you use, the pinker it will be. Our daughter loves it a little pinker. Made it this morning.. Loved it! It is very nourishing but also feels like you’re having dessert for breakfast. Thanks for the recipe. Can you use vanilla extract and regular honey? Do we need to cook the oatmeal? Could you add spinach or other greens to this? You should have included nutritional info, especially carb content. I just made this. And after drinking about half.. I realized that coconut milk (which you recommended and which I used) has a whopping 500 calories in 1 cup if you use canned! I stopped drinking. 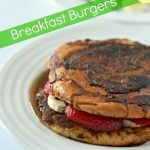 I usually consume 200-300 calories for breakfast, not 600-700! I will make this again because it’s delicious, but next time, I’ll use regular or almond milk. Hi Courtney! That must have been one tasty smoothie! That being said, we use coconut milk that you would find in the dairy section. Should be no more than 45-60 calories per glass. 🙂 Canned is great for some recipes, however we do not recommend using canned for this. 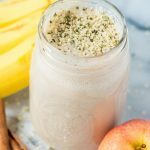 Could you post the nutrition info for this smoothie? Is it possible to use the vanilla powder? 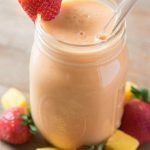 How many total calories are in this smoothie? The calories will vary depending on the liquid that is used. Soaked in water. 🙂 This will reduce the phytic acid in the oats. I just made this on a whim, and it’s very tasty!! I made quite a few changes, however, to add in protein, reduce added sugar, and reduce time. Can you please explain where the 15 grams of fat are coming from? Thank you.